What conditions are needed for plant growth? 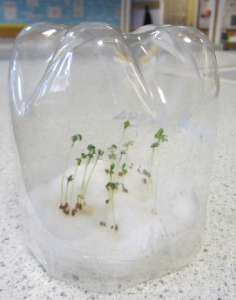 What factors affect the growth of plants? Build a mini-eco system - a terrarium - and explore what helps plants to grow and what inhibits their growth. Put some cotton wool in a Petri dish - you may wish to measure this accurately. Count out a specified number of seeds, eg. 20. Add a specified amount of water - around 20ml works well. Cut the bottle to a specified height or volume - you can use both the top and the bottom ends. 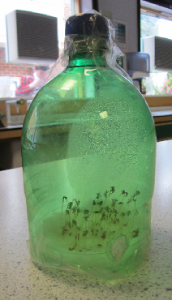 Put the bottle on top of the Petri dish, as in these photos, and seal the bottle around the dish with sellotape to make a self-contained eco-system. You will need to decide what data you want to collect before you start the experiment. You will also need to decide whether to collect data weekly or just after a certain number of weeks. The number of weeks depends on what seeds you use - cress should show significant growth after two or three weeks. Collecting data. Biology. Maths Supporting SET. Interpreting data. STEM clubs. Processing and representing data. STEM - physical world. Handling data. Comparing data. STEM - living world.